lt;stronggt;UNV78001lt;/stronggt;lt;BR/gt;Universal Medium-Duty Filament Tapelt;BR/gt;Even though you may not be packaging boxes and bundling pipes with enormous weight sizes, you still want a reliable and strong filament tape. For dealing with these medium-duty packages and jobs with weights up to 50 lbs., look no further. Tape features a film backing, reinforced with fiberglass filaments to produce a 180 lbs. tensile bursting strength. Comes with a 3amp;quot; core. 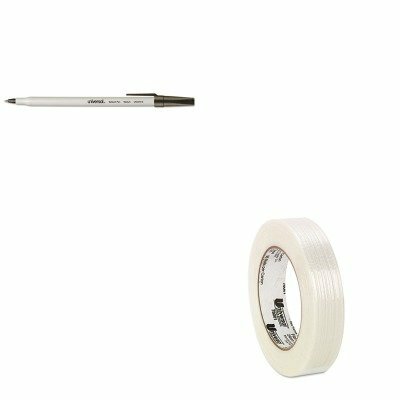 Tape Type: Packaging.lt;BR/gt;lt;BR/gt;lt;stronggt;UNV27410lt;/stronggt;lt;BR/gt;Universal Medium-Duty Filament Tapelt;BR/gt;Lightweight yet durable, this pen is reliable from the first mark to the last. Economy ballpoint pen is a value-priced office standard. Oil-based ink dries quickly, keeping your documents safe. Special Ink Type: Oil-Based Pen Style: Stick Ink Colors: Black.